Planning A Wedding or Party Can Be A Surprisingly Stressful Experience. Supplier difficulties are considered one of the main reasons for stress resulting in financial challenges, relationship and health problems. Not the way to start married life! The chances of an event supplier not delivering the service they have been booked for is unfortunately, remarkably high. In the UK 50% of all start up businesses fail within the first 12 months and 86% fail within 5 years. Photo Booths have grown exponentially in popularity over the last 5-10 years and hiring a photo booth is now considered an essential for a wedding celebration. 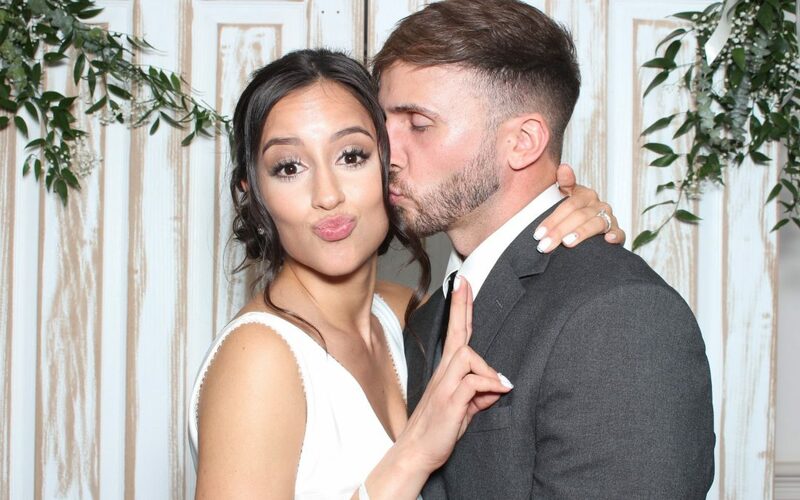 Alongside the pure entertainment value, one of the highlights of hiring a photo booth service is spending time looking through a guest book filled with messages and photos from loved ones after the event. This combined with your guests returning home with handfuls of prints makes the photo booth service a compelling addition to any wedding or party. Hiring a photo booth is considered one of the most effective ways to bring guests together whilst simultaneously creating fun and memorable experiences for the whole wedding or party. In the UK there are approximately 500 – 600 active photo booth hire businesses of which a vast majority are owner/operator businesses. Meaning that many of them are run and delivered by one individual. 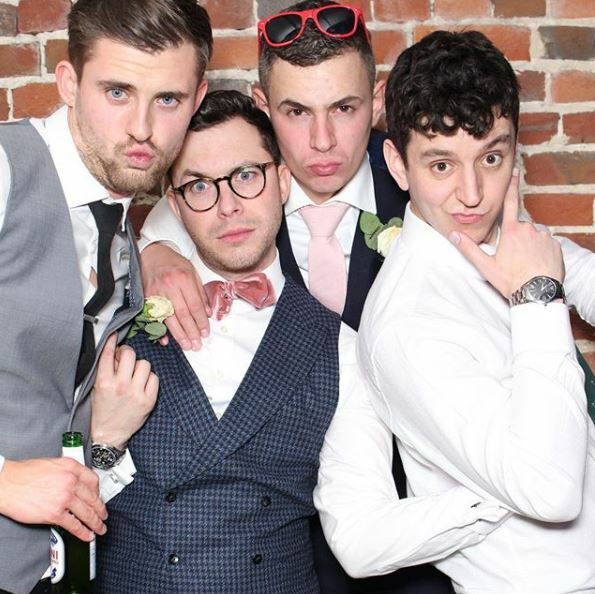 The owner of this photo booth hire company received thousand of pounds in deposits but only delivered a handful of events. In the hope of growing the business they found themselves agreeing to deliver an enormous amount of events without the resources or ability to deliver. Resulting in hundreds of brides without a photo booth for their celebrations. Low prices and “too good to be true” offers meant that hundreds of brides who booked with Bake a Cake were left without a photo booth and other services for their wedding day. Using facebook advertising they offered incredibly low prices resulting in many couples handing over deposits or balances that were never returned. How long has their business been running? Do you really want someone learning on the job at one of the most important occasions in your life? I wouldn’t and you shouldn’t either. You deserve a seasoned professional who has demonstrated an ability to consistently deliver excellence no matter what curve ball is thrown at them. How many events do they do each year? If they can answer the first question to your satisfaction, but they’re only doing a handful of events a year this should set alarm bells ringing. Low numbers of events either means they’re not serious or there’s something in their business model that’s not delivering. It could be that they just haven’t nailed their marketing, but the more events a supplier does or has done the better equipped they are at understanding how to deliver excellence for your celebrations. Can I have your last 10 testimonials? 10 is a good number. Check the dates of these and also the source. You want a supplier that is providing you with recent testimonials and doing it in a transparent way. Facebook is fantastic at collecting testimonials for business pages as well as trust pilot. Also do a search online by typing the business name followed by the word “review”. It’s surprising what comes up. Finding a less than positive review doesn’t need to stop you in your tracks as sometimes the unavoidable happens, but check on the details of what happened and how the business looked after the less than satisfied customer. So many times we hear stories of how an incident has occurred to a supplier and they have been unable to deliver their service resulting in them palming off the event to another nearby supplier (who you may have not wanted to use). It’s inevitable that life will get in the way, whether it be failings in managing their own administration, illness or equipment. Yet in the events industry we often accept the whole business delivery being down to one person. It could be a DJ, a caterer, a venue decorator or any number of others. The bigger the team the less likely this is to happen. What happens to your booking when if an issue occurs? Make sure you’re looking for an established team so that if things go wrong with one person you’re not left high and dry and the business can get on with delivering you the service you’ve paid for. It isn’t just about the number of team members but what systems and processes does the business have for the unexpected. You want someone that has tried and tested contingency plans. Everyone wants a deal, but you should expect transparency with pricing from your supplier. If they’re asking for further information before giving a quote then that’s normal, but be cautious if their pricing strategy is wildly erratic or well below the industry norm. In the events industry deposits prior to the event to secure the booking is common place. The challenge is in determining whether you are actually getting a deal or are you just being suckered in by a sales pitch in order to get your deposit? Established business with a strong track record are very unlikely to do this, but there are a lot of people out there that just want the cash as quickly as possible. They’ll tell you a great offer, achieve the booking and deposit and then drop your event a few weeks or even days before with some excuse about theft or damage to equipment. In the meantime what they’ve actually done is traded your booking for another one that was willing to pay a far higher price. This happens surprisingly often so don’t be fooled by low prices. It either means they don’t know what they’re doing, have a sub standard product or that they’re up to no good. This isn’t retail where you buy in volume to get a low price and can sell it cheaply. This is a service and once they are hired on a date that date is then gone from their diary. What insurances and certificates do you hold? If they’re not insured and their equipment isn’t tested then it’s unlikely your venue will even allow them on the premises. Venue requirements on suppliers have increased significantly in recent years with many requiring the supplier to have insurance cover of a minimum of £5m. Can you show me images and/or videos of your work? Get them to send you this and scrutinise this in the same way you did when you walked round the venue you chose. How does it stand up? Is it well presented? Does it demonstrate their attention to detail? Is it a true reflection of the service they’ve described? Many small business websites are months if not years old in the content they produce ask for the most up to date view as to what they’re doing and how they’re doing it. What do their social media pages look like? If they’re busy and creating great work then you’ll see it here. They’ll proudly be displaying content to an engaged group of followers. It’ll also often give you a behind the scene glimpse into the business where you can see if this is in keeping with the communications you’ve had so far. If there is little content or just unrelated random content then be warned there’s a part of the story you’re not seeing and should be. 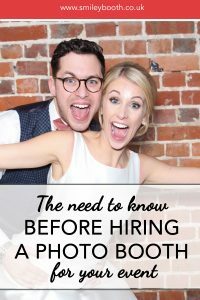 What should you look for when hiring a Photo Booth? The most popular additions to basic photo booth hire are to customise the photo prints, a photo guest book service and props and accessories. They should have many years of experience in delivering Photo Booth hire. You deserve a company who has demonstrated an ability to consistently deliver excellence no matter what curve ball is thrown at them. This goes for the booth attendants as well as the company itself. Many weddings are booked between 12-18 months in advance. Be aware that suppliers with less than 3 years experience will be unlikely to have delivered a significant number of events to ensure they have the experience you deserve for your celebrations. Ensure the photo booth company has systems, checks, and processes to be sure you receive a perfectly delivered photo booth service that you and your loved ones can enjoy. This system should ensure you receive your photo booth exactly at the time you requested it. If the price sounds too good to be true it usually is. A company offering a similar service for a far lower price should be avoided. Check the details of the package offered. Ensure there are no hidden costs such as travel costs and restrictions such as only 1 print per session. Check their work. A photo booth is obviously a visual service and it is therefore easy to check their work. Look at the relevant social pages (particularly Instagram and Pinterest) and ask for examples and testimonials. When hiring a photo booth with Smiley Booth you’ll go through the following check points to ensure you receive our best service. Confirmation that your venue has been contacted and re-confirmation of all booking details. Relax and enjoy looking through your very full guest book of messages and images. Smiley Booth are photo and video entertainment specialists who build world class experiences that deliver a lasting and meaningful impact long after the event has past. Our staff are friendly, professional and highly trained. We also have a technical support team available to our staff at every event should any issues arise. Our prices are transparent and all our packages are fully inclusive.